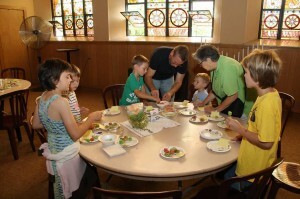 A form of church for children and adults that involves creativity, celebration, and hospitality. It includes a welcome, a creative time to explore a Biblical theme through crafts and activities, a short celebration involving story, prayer, and songs, followed by a free meal. It’s for children and adults to enjoy together. It promotes good ways of growing as a family: a nuclear family, an extended family, and a global and local church family. It welcomes people who aren’t comfortable with traditional church services. Its aim is to introduce Jesus, to give an opportunity to encounter him, and to grow closer to him.